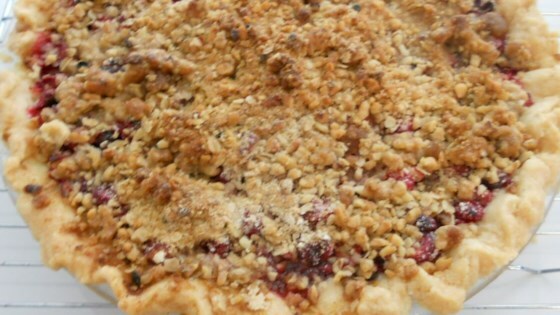 "A delightfully tart cranberry pie with a yummy walnut streusel topping." Smash berries. Stir in sugar and 1/4 cup flour. Pour filling into pie crust. Smash walnuts into small pieces. Stir in brown sugar, 1/4 cup flour, and shortening with a pastry blender. The mixture should be crumbly. Sprinkle streusel over pie. Place pie on a baking sheet and bake in preheated oven until crust is golden and filling is bubbly, about 45 minutes. Very tart, but good anyway. I used pecans instead of walnuts and it tasted good anyway. Sweeten it up by serving with ice cream or whipped cream. I also chopped the berries. I found it difficult to crush the cranberries very effectively. I recommend chopping them.